We're about to go national. With the passage of Bill C311, we're now in a position to sell wine to any customer in the country. There's a few minor details to be sorted out, but for all intents and purposes, the old rule about individuals not transporting wine across provincial borders is finished. Pinot Noir fans across the country will shortly be able to drop in to our great new home on the internet and select what wines they want. Our new relationship with Blacksquare out of Calgary will soon give us a place we can welcome our fans and allow them to enjoy our Pinot, no matter what province or territory they may live in. If you're not already on our contact list, please fill out the form at the top of the right sidebar. We have an entertaining newsletter that goes out quarterly and we'll be using this list to let you know when our new site goes live. Shipping Wine Anywhere In Canada? If you've been following the wine news in Canada lately, you may know that the federal government may allow the citizens of the country to transport wine across provincial boundaries. Currently, due to a law enacted shortly after the end of Canadian prohibition in the 1920s, alcohol can only cross provincial lines under the authority of liquor control boards. The average Canadian didn't know this law even existed as it is rarely mentioned. So if you have been bringing a bottle from BC to Alberta (or any other interprovince situation), you've been acting contrary to the law. This prohibition has been a substantial roadblock for many small wineries who would like to sell to their fans that visit in person or are on their customer lists, no matter where they're from. While control boards don't bother with Joe Consumer, they are known to bring pressure on producers they suspect are shipping into their jurisdictions on behalf of customers. I said "may" because Bill C-311 was scheduled for final reading (and vote) and had all party support in the House this week. But then, strangely, the official opposition New Democratic Party (NDP) began what appeared to be a filibuster. Depending on who you talk to, they did it either deliberately, mistakenly or stupidly or a combination of all three. It looked liked the bill would die on the order paper and not reappear until the late fall. But a couple backroom moves and an apology by the NDP allowed the bill to be put back on this session's agenda and the NDP assured the nation through Minority Leader Nathan Cullen that the NDP would support the bill in the next go-round. Dan Albas' private member's initiative looks like it will pass. Each province's liquor control board will decide how to allow a personal exemption. There could be some wide variance on amounts and frequency. And they'll do it reluctantly. In fact, BC's Control and Licensing was the only board that expressed support for this bill. Social media has played a major role in creating a wave of support. #BCwinechat, a Twitter hashtag, can give you a sense of the passion involved in this crusade. For even more background, also check out #freemygrapes, the battle cry of a national advocacy movement to have restrictive wine laws changed. We here at Black Cloud have been waiting for this since we started. Our philosophy from the start included having any Canadian of legal age be able to order our wine anywhere they may be in the country. We have received many requests from fans across the nation and we are ready to ship on day one. If you'd like to stay current on this issue, sign up for our quarterly newsletter in the sidebar of this blog. We're hoping that very soon we'll have unfettered access to our national market. Something that hasn't been seen in over 80 years. You enjoy wine, you may even collect a few bottles to share with friends on special days. But if you're not ordering your BC wine directly from the winery, you're probably missing out on some key advantages. When it comes to buying BC wine, government and private wine stores certainly have their attributes. They're conveniently located in your neighborhood, carry a wide selection of imported and domestic products and, in some stores, knowledgeable staff are on hand to lend their expertise. There's often an opportunity to taste wines before purchasing and it's a great environment to discover new wines. A few that come to mind: Liquor Plus on the Island, Bowen Island Beer and Wine, Firefly Fine Wines and Ales, Stag's Head Liquor Store in Kamloops, Marquis Wine Cellar and Sutton Place Wine Merchant. Selection: There's not too many retail operations that can carry the entire line-up from any particular winery. On the winery's website, you can browse through current selections, back vintages, different size bottles, limited production labels and other special items. Often, some wines are only offered to customers on the winery mailing list. At the winery or on their website, there's less chance of missing out on your favourite label. Price: Private stores will be a little more than the winery. That little extra gives you their expertise, unbiased opinion and other guidance. Government stores will be the same price as the wineries. But most wineries will have some special discounts and deals that will make visiting their websites worth the effort. Many add free or reduced shipping at varied pricing thresholds. Product Integrity: Can you guarantee your local outlet stores its products as well as the winery does? If so, great! But you can be assured wineries take extra care and attention when it comes to handling their own packaged product. Their reputation is on the line. Support: People talk a lot about supporting the small business, the mom and pop shop or the local start-up. This is one way you can act on that talk. Your cash stays local and helps further development of the wine country community. In the case of our brand, Black Cloud, our modest production makes it difficult to distribute through traditional sales channels. Most of our sales are through individuals who have signed up for our quarterly newsletter, social media exchanges and word-of-mouth. Only producing Pinot Noir makes us a niche wine. Through our Cloudy club, members can find various vintages and different sized bottles. And anywhere in BC, we ship for free on orders over $25. 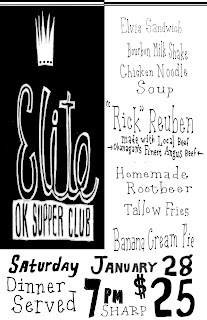 Supper Clubbing at the Elite. One of the toughest transitions you'll ever make is the one from big city urban living to small city semi-rural living. I've been in Penticton for most of the last 16 years and it still surprises me at how hard you have to work to make 'off-season' life stimulating. In the city we were used to everything being right at our doorstep. There were many times when we would just go 'out', to wander down a busy street and wait until something caught our interest enough to make us pause and perhaps engage. Restaurants, clubs, galleries, shops; all vying for your attention and wallet. Not so much in Penticton and other small BC interior cities. 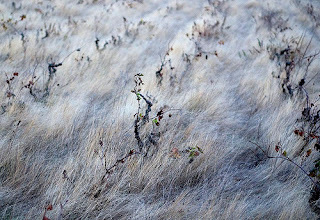 You could wander around plenty but all you might engage is a little frostbite. Now, in the depths of winter and at the end of January, we are at our most susceptible to periods of auto-pilot or Seasonal Affected Disorder (SAD) for the most extremely touched. 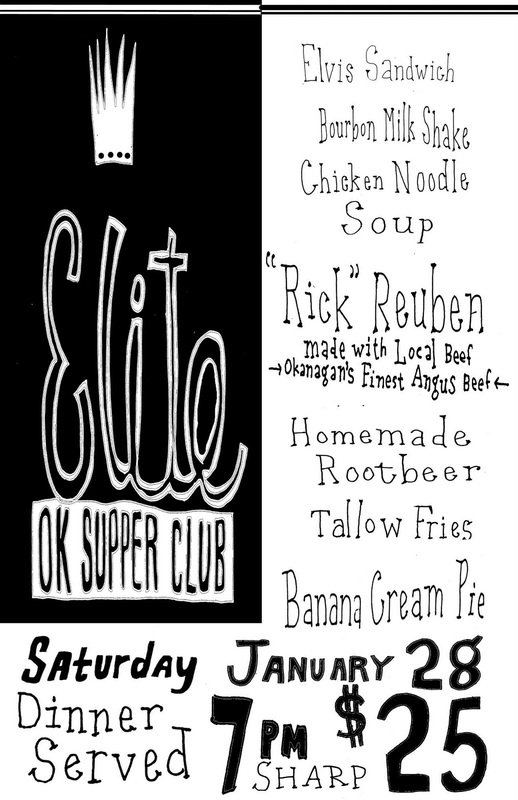 That's why when the invitation to participate in this new OkSUPPERClub at the Elite restaurant in Penticton came along was we jumped at it. The menu, prix fixe, looked adventurous and eclectic. And very reasonably priced at only $25 per person. Who doesn't love to experiment? Dinner was advertised at 7 SHARP so we politely arrived about 6:45 and were promptly seated. The kooky, time-machine decor of the Elite amused us as we sipped a couple Cannery Brewing Squire Scotch Ales while watching a silenced The Misfits with Clark Gable, Marilyn Monroe, Eli Wallach and Montgomery Clift on a nearby big screen. Suffice to say, the mood was established. The room filled and it was easily a sell-out. I'm glad I didn't opt for wine. It would have been nearly impossible to pick a single style to accompany the varied courses that followed. Sometime around 7:30 the first course came out. It was the Elvis sandwich accompanied by the Bourbon Milk Shake. The two worked well together. I'm usually accustomed to this much sweetness at the end of the meal, but in some weird way it all actually performed admirably as a lead course. There wasn't much of description on the menu, and the servers offered no clues, but the peanut butter and banana inside a kind of toast was off-set by what we thought was a very nice carmelized onion relish with a little bacon. The milk shake was potent; enough to make the shooter-sized glasses very appropriate. After a little break, serenaded by a selection of blues, surf and rockabilly oldies, we recieved the Chicken Noodle Soup. The broth was full and robust, there were ample noodles and vegetables. It was a perfect blend of home style and innovation. I could have devoured a big bowl with a loaf of fresh bread and been very happy. Just after the soup we received a couple tumblers of home-made root beer. It takes decades if not generations to get a root beer recipe right. This one was a gallant attempt, but as explained by the developer, had a few things going against it, not the least was a failure to naturally carbonate. There were some very vibrant flavours at play but not quite in the right balance. With only a small delay, the next course arrived. Billed as the Rick Reuben, it was a chunk of brisket lightly breaded and fried, topped with kind of slaw or kim chee like cabbage preparation, sided with what we guessed was potato salad and a coarse mustard. The pastrami-style brisket was smokey and moist, I would have loved to have this thinly shaved between two pieces of rye. The outer crust was a non starter. I didn't get much from it. The pickled cabbage and veg was not quite kraut, not quite slaw. It was very piquant, and when you added in the mustard and the brined meat, there was a true battle for vinegary supremacy going on the plate. Apologies for eating a portion before taking the photo. I saw many diners finishing every bit on their plates but for me it was too sharply acidic. We were then served some very good French fries with a side of gravy. The fries were done perfectly with an understated spice note added. The gravy was mild and almost flavourless. Dessert was banana cream pie. Many times this classic is prepared with a layer of banana slices somewhere in the pie. Which is unfortunate because by the time it is served they begin to brown and grow mushy. Very unappetizing. Not so with this dessert. The bananas were all blended into the cream section, and resting on a dark chocolate cookie crumble crust. Topping the pie was a praline whip cream that was beaten to within a hair of being butter. Top marks for appearance but I tasted an inordinate saltiness in the crust mixture. Loved the rich banana flavour of the filling. Plenty of fun and a good learning experience for all. I'm looking forward to the next event. I'd like to see a bit more narrative; either verbally from the servers or written on the menus, about what we are being served and maybe, after the meal, a Q and A about choices the chef made in his sourcing and preparation. 2010 Fleuvage - Pinot Noir just around the corner. 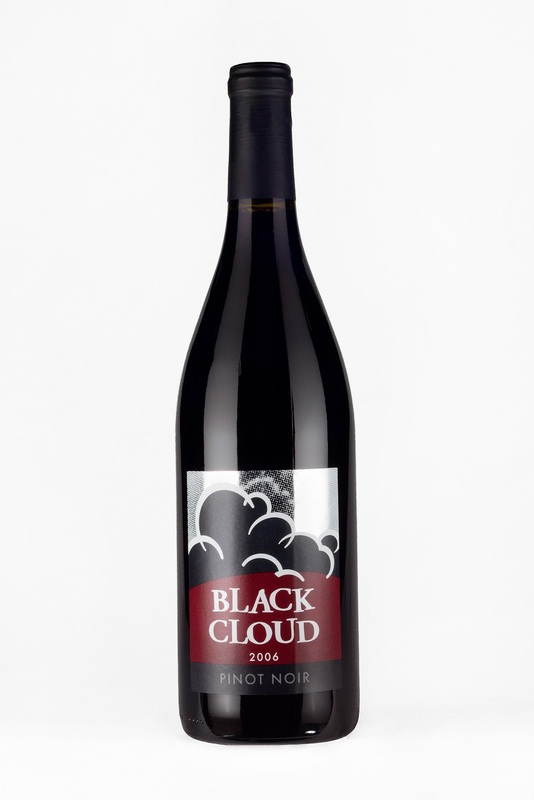 We're only a couple weeks from bottling the 2010 Black Cloud Fleuvage Pinot Noir. There have been some delays as we wait for the flavours to perfectly fall into place. We'll be looking at a spring release. Fleuvage is our essential, fruit-driven Pinot Noir. It's $19.99 retail and a favourite among restaurants and lounges looking for a medium-bodied red to pour by the glass. To be first in line to get some by making sure you're on our newsletter list. We encourage private customers and members of the trade to take advantage of this offer. Just fill out the form below. Pretty great comment! Thanks, Tim! The 2009 Altostratus is now available. It should be appearing in a few BC retailers soon. About 45 cases (including some magnums) are in Alberta and it's available at the Wine Shop on 16th SW in Calgary. If you'd like to order some of the best Pinot Noir you've ever had, just drop an email to bradley@blackcloud.ca and we'll get the ball rolling. Pinot Noir Prepares for Premiere. This is an exciting time of the year. The grapes are racing towards ripeness as unseasonably warm weather tries to make up for a very slow start. 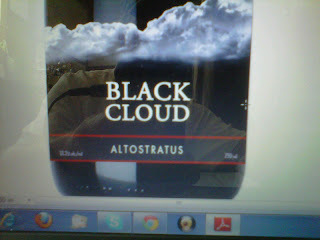 Here at Black Cloud headquarters, we're preparing to release the 2009 Altostratus. We're starting with a free tasting and pre-release event at The Wine Shop in Calgary. 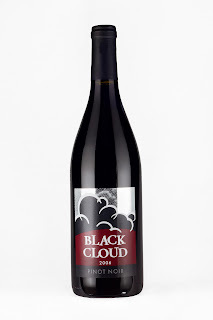 The guys at The Wine Shop have been very good to us, easily our biggest reseller and spreading the word about Black Cloud to anybody who will listen. Winemaker Bradley Cooper (me) will be at the store from 2 to 5 this Saturday, September 10. We encourage our Alberta fans to drop by to taste and chat and maybe pre-order some Altostratus. A drop in crop levels in 2009 means we won't have as much available as before. The BC release starts with an event in the works for Penticton (our home base) that coincides with the Okanagan Wine Festival at the end of the month. Watch this space for details. We're also excited about the debut of our label re-design. Here is a rather high-quality photo (lol) of the mock-up. Trust me. It'll look way better on the bottle. 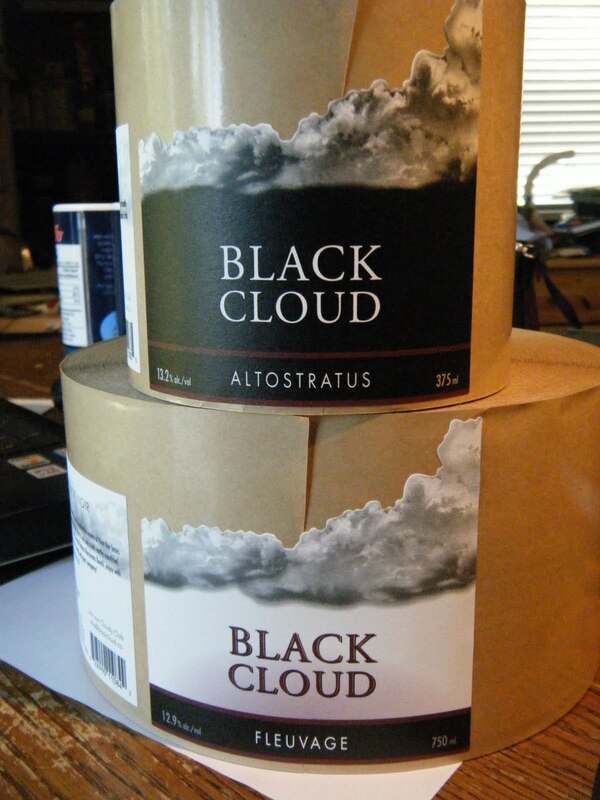 If you're looking to get some of the 2009 Altostratus, please join our Cloudy Club by emailing to info@blackcloud.ca and letting us know you want to get a little cloudy. My wife Audralee and I had a chance to drop in to Remuda Vineyard in Okanagan Falls last weekend and take a look at the Pinot Noir with the owners, Dwight and Arnie Gash. Although a week or so late, just like last year, there is a lot more fruit. The damage from the 2009-2010 winter is just about resolved. We're looking for a longer ripening period for the Pinot and I hope the extra hangtime will result in the same rich and complex flavours we're familiar with. This vineyard is on a 5 to 8 degree slope, with a southwest aspect. The soils are glacial till. Lots of gravels and boulders that allow excellent drainage. In the picture I'm in you can see some the large stones that have been cast up. Pretty typical for the whole property. The vines, grown on a modified Scott-Henry trellis, are in great shape. A couple days after these photos were taken leaf plucking was started to give the fruit plenty of exposure. Colour is never an issue for the Pinot on this property. All the Pinot from Remuda Vineyard goes to our Altostratus tier. We're currently selling the 2008 with the 2009 due for release in September. Wine Making and Winery Ownership in BC - A pastime for the wealthy? After being in this industry for more than 15 years and observing how things work, I'm beginning to suspect that making wine for a living in this jurisdiction is an activity reserved for the rich. This in itself is not a revelation. I'm not talking about the day-to-day labour in the cellar or the vineyard. By wine making I'm suggesting the ownership of land and facilities in order to do so. It's becoming clear that the regulations for operating and licensing a winery favour those with substantial financial clout and basically keep people of modest means from playing any significant role. I think some of those restrictions have been created for the sole purpose of restricting the number of players in the field and to promote the BC government's long time agri-tourism push. And this kind of environment limits innovation, new blood and a free market. Considering the price of land in BC, it would require a minimum of $300,000 just for dirt for a land-based winery license. That's before equipment, agricultural costs and infrastructure. One could entertain a 'commercial' winery license, but that's just basically an extension of the BC Liquor Distribution Board's retail system. You'd miss out on the great system of kick backs given to land-based wineries that produce VQA products. Next add in the licensing requirement for a 500 case annual production. This artificial constraint means you'll be looking at a minimum of 8 tons of grapes (about 60 cases per ton) at a cost of somewhere between $1200 to $3,000 per short ton. Let's split the difference at $2100 per ton or about 17 grand right out of the gate. The point is: if you're a good winemaker who would just like to buy some grapes, make some wine and sell it on the open market: you're out of luck. Why should there be some arbitrary number for production? What has that got to do with great wine? I queried friends in other jurisdictions. My contact in California knew of no constraint in the size of the operation while in Ontario another friend suggested things may be even worse. There's no system to allow shoestring operators to simply take part in the market. I propose licensing follow the precedents set be the food industry. The priorities should be about good sanitation, proper disposal of waste and other environmental concerns in concert with local requirements. Not some made up number for case production and the requirement for tracts of land that may be the most expensive agricultural land in Canada if not all of North America. It's time this lazy, bourgeois style of licensing was changed to allow innovative and dynamic new producers.